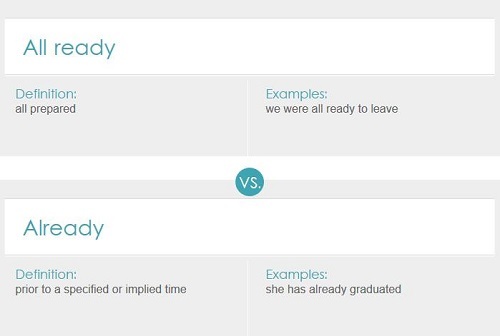 ‘Already’ and ‘all ready’ can be confused, as they sound similar and they are spelled in a similar way. They come from the same etymology, as well. However, their meanings are very different, and they are different forms of speech. Both of them come from putting the words ‘all’ and ‘ready’ together in different ways. ‘All ready’ leaves them as separate words. ‘Already’ is formed by putting the Middle English prefix ‘al-’ in front of ‘ready’ – or, more specifically, ‘redy’, the predecessor of that word which meant the same thing. ‘Al-’ was an alternative form of the prefix ‘all-’. ‘Ready’ is an adjective. It has a few meanings. The first is to be prepared for something. The next, usually used with a preposition such as ‘to’, is for something that is likely to happen soon. It can also mean that a quality a person has is quick to come to the forefront. So, in short, it means something or someone that is prepared, or something that is about to happen. ‘All’ is used most often as a determiner, which is a special class of word used in a noun phrase that determines whether it is definite or indefinite. However, it is also used as an adverb. There, it means ‘entirely’ or ‘completely’. ‘All ready’ is an adjective phrase. When something is all ready, then it is completely prepared. Sometimes, the two words will show up together, but will not be forming this phrase. If ‘all’ is being used as a determiner to express everyone or everything in a group, then it can appear in a sentence. This is especially true in second person, because English does not have a plural second person. ‘You all’ is one of the most common phrases used to address more than one person in a group. ‘Already’ is an adverb. It means that an action has happened before a set time. This is usually before the time of speaking. It can also be used for something that happened sooner than expected. In the United States, it can also be an intensifier used to express impatience. This is most likely influenced by the Yiddish word ‘shoyn’, which expresses the same sentiment. ‘Already’ most likely developed as a metaphor meaning something was so completely ready that they could begin ahead of time, or they were so ready that it had already been taken care of. There are a few similar words in the North Germanic languages, such as the Danish ‘allerede’, or the Swedish ‘allaredan’ or ‘redan’. It is also found in Dutch, a member of West Germanic – the branch English is from – with the older word ‘alreeds’. The pronunciations of ‘all ready’ and ‘already’ are very similar, but there is a slight pause between the words in ‘all ready’. ‘All ready’ is also more likely to have a preposition after it, especially ‘to’ or ‘for’. When ‘all’ is being used as a determiner instead of part of the phrase, then there is an even longer pause. There may also be some emphasis put on the ‘all’ when it is not part of the phrase. To summarize, ‘all ready’ and ‘already’ are both the combined words ‘all’ and ‘ready’, though ‘already’ uses the ‘al-’ prefix. ‘All ready’ is an adjective that means something is completely prepared. ‘Already’ means that something has happened sooner than expected or before a set time. Kianna. "Difference Between Already and All Ready." DifferenceBetween.net. June 8, 2016 < http://www.differencebetween.net/language/difference-between-already-and-all-ready-2/ >.